Halfpap was born in Steinborn, Prussia in 1870. His father worked as a gardener for the manorial area of Steinborn. 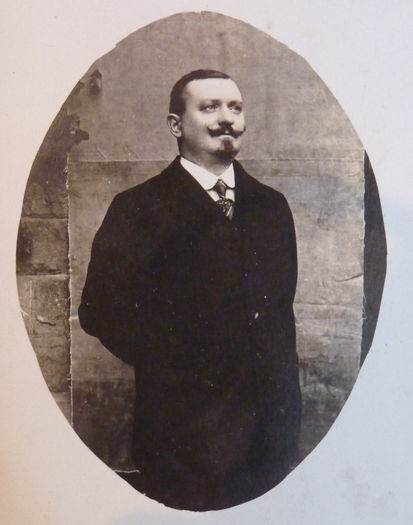 Little else is known about his childhood, but his personal archive shows a letter of recommendation following a three apprentice as a patissier in Paris (1886-1889). The first official record of Halfpap in England comes from 1891 census where he is recorded as living and working as a cook in the Knightsbridge area (Chesham Place) of London for the Russian ambassador. From here Halfpap returned to Germany where he served in the 8th Company Grenadier Regiment Prinz Carl von Prussia 2nd Brandenburgische No. 12 (1891-1893). On his release he moved to Liverpool where he married Mary Ellen Denehy in October 1895. The baptism record of his daughter Nellie shows that in 1900 he was living in Penwortham, Lancashire where his occupation is listed as Chef. The 1901 census shows that Halfpap was still working as a hotel cook in Chorlton, Manchester. His personal archive shows that following this he worked for a brief period at the Royal Hotel Ventnor, Isle of Wight (1906). By 1911 he was working in Harrogate, where he lived with Ellan, their five children and sister in law in Westcliffe Terrace. He was member of the Royal Forest Lodge, Order of Buffaloes. Little is known about Halfpap’s war time experiences, other than the fact that like many German nationals he was probably forced to register his nationality at the beginning of the war and was subsequently interned. According to his family he never really spoke of his time in Knockaloe, but he seems to have taken an active role in the art community creating bone vases and number of paintings. Following the war Halfpap moved to Derby. Later he relinquished his German nationality and had become naturalised British citizen (1929), at which time he is shown as living in Glasgow. Halfpap death was registered in Knaresborough in 8 August 1943, and was buried in Harlow Hill Cemetery, Harrogate.